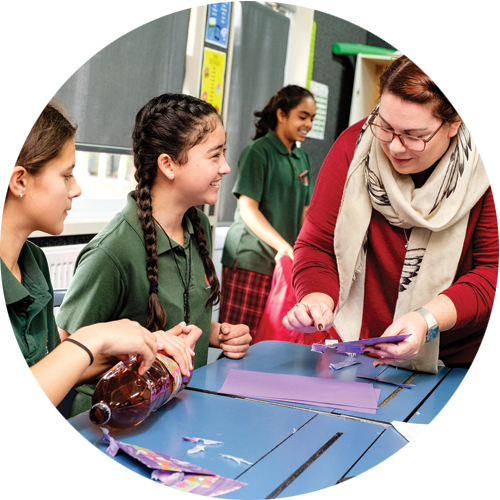 The Wonder Project is Engineering New Zealand’s free programme for schools that fits seamlessly into the New Zealand school curriculum. Each school is supported by a team of industry professionals, from the likes of Rocket Lab, Air New Zealand, Xero and other well-known organisations around New Zealand. "It's a hands-on, fun way to explore the learning areas of STEM. Students had to work through a process to see success. Everyone was so engaged and excited throughout the project." We’ll pair you with a passionate STEM professional and the resources you need to run the Wonder Project successfully in your classroom. For the Rocket and Community Challenges, you’ll need an hour to meet with your Wonder Project Ambassador before you start running the programme in your school. Then, once the programme starts, each lesson is around 45 minutes over a term (6–8 weeks). For our STEM Careers programme, talks are provided on an ad hoc basis and run for 30–40 minutes. Don’t be nervous – we’ll give you all the resources you need, plus an industry professional that's a STEM expert. Once you’ve been accepted into the Wonder Project, you’ll have access to resources that will show you how to run our three programmes easily. You’ll be working alongside a Wonder Project Ambassador who is an expert in their field. So, even if you don’t have a STEM background, you can still run the Wonder Project! Working hand-in-hand with an Ambassador means you and your students get all the specialist support you need to run the programme you select over a school term. You’ll need to meet up with your Ambassador beforehand so you’re prepared with everything you need to run the programme successfully. enhance the student experience with the NZ curriculum. The Wonder Project is Engineering New Zealand’s programme for schools and we’ll be with you every step of the way. We’ll be in touch with you before, during, and after the project, making sure you feel comfortable and supported. We have a dedicated team who will be available to answer your questions Monday to Friday.